The chucker~ takes a specified amount of audio data, stores the data in an internal buffer, divides the buffered data into equal sections, and allows the sections to be reordered on playback. Note: The actual allocation will be larger than what is specified by the argument, since the chucker~ object supports two buffers and provides for double-buffering. The message freeze 1 causes the current buffer segment to loop on playback. Sending the message freeze 0 resumes normal playback. The word nsteps, followed by an integer in the range 1 - 64, sets the number of equal portions into which the chucker~ object's internal buffer is segmented for playback. signal In left inlet: Left channel audio input. In middle inlet: Right channel audio input. In right inlet: An audio signal in the range 0. - 1.0 provides the audio sync input. This task is typically done using a phasor~ object's output as input. The word smooth, followed by a floating point number in the range 0. - 1.0, sets an amount of smoothing (crossfading) between the individual segments being reordered for playback. 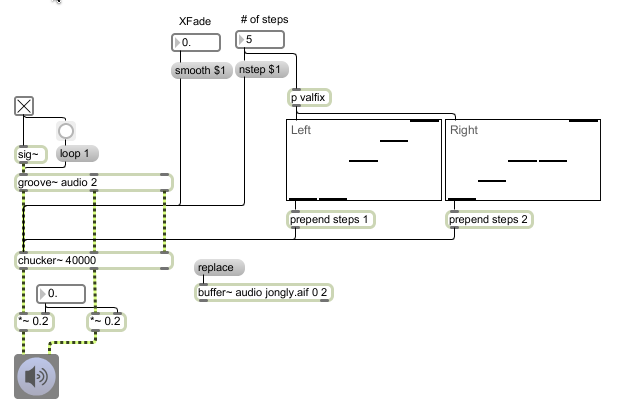 The word steps, followed by a 1 or 2 to indicate left or right channel and a list of integer values whose range is between 1 and the number of steps and whose length is equal to the number of steps, sets the order of playback for the sections.